You might be surprised to learn that air pollution is declining in the U.S. and that Americans are living longer because of it. The news comes from the Harvard School of Public Health, where researchers linked living longer with fewer fine particles of pollution in the air and in our lungs. In fact, our longevity could still improve as time goes on if we continue to lower air pollution levels. With the industrial boom, little thought was given to air pollution, but the past few generations have worked hard to clean the environment. 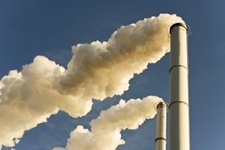 With the greater focus on environmental impact, industry has had to clean up their act, and emissions across the country contain less particulate matter than they used to. Particles that are less than 2.5 micrometers in diameter are most dangerous to our health. We breathe them in, and they can be responsible for serious health problems with the heart and lungs, which can hasten death. The Harvard researchers examined how this type of air pollution was affecting the health of people in 545 U.S. counties from 2000 to 2007. They found that a drop of 10 micrograms per cubic meter in fine particulate matter was linked to a four-month increase in life expectancy. That’s a tiny reduction in pollution for such a significant result. The more populated an urban area is, the greater the link between pollution and life expectancy. The study also found that women seemed to benefit more than men from better air quality (but it did not postulate a reason). A similar recent study found that long-term exposure to particulate matter is directly tied to heart failure. Correia, A et al., “Effect of Air Pollution Control on Life Expectancy in the United States: An Analysis of 545 U.S. Counties for the Period from 2000 to 2007,” Epidemiology, published online December 3, 2012.